On Thursday Ruth Cadbury MP chaired a listening event on Crime in Isleworth, and was joined on the panel by Rob Whyatt, from the PEACE Project, Chief Superintendent Paul Martin, Cllr Katherine Dunne and Cllr Steven Curran, along with Seema Malhotra, MP for Feltham and Heston. Also present were representatives of West Thames College, Isleworth multi faith group, senior and local police officers, neighbour watch groups and community organisations. 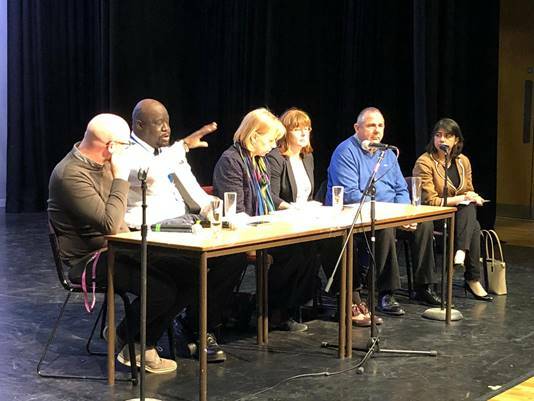 The event was held to allow residents to discuss crime in Isleworth, and to give their views on the causes, and solutions, whilst also asking questions to the panel on a range of subjects from youth crime, to drug dealing, to police numbers.